Our children spend many of their waking hours in the classroom. It’s where their aspirations are nurtured and where they get their first sense of what their society expects of them. When run correctly, it’s a place where imagination is cultivated. But that cultivation doesn’t always happen. Human brains digest the world to produce novelty — but too many classrooms offer little to be digested, instead proffering a diet of regurgitation. That diet threatens to leave our society hungry for future innovators. We’re stuck in an educational system born during the Industrial Revolution, in which the curriculum was regularized, children listened to chalkboard lectures, and school bells replicated the factory bells that signaled a change of shift. That model doesn’t prepare our students well for an advancing world, one in which jobs are rapidly redefined and the prizes go to those who can generate novel opportunities. The real job of classrooms is to train our students to remake the raw materials of the world and generate new ideas. Fortunately, it’s not difficult to implement; it doesn’t require tearing up existing lesson plans. Instead, here are some guiding principles to help turn any classroom into an environment that promotes creative thinking. 1. Use the past as a launching pad to imagine the future. At the start of the school year, Pennsylvania art teacher Lindsay Esola draws an apple on the board and asks her fourth grade students to draw their own versions. The majority of class merely copies the teacher. But this exercise is the jumping-off point for a semester in which Esola teaches her students dozens of ways of drawing an apple. 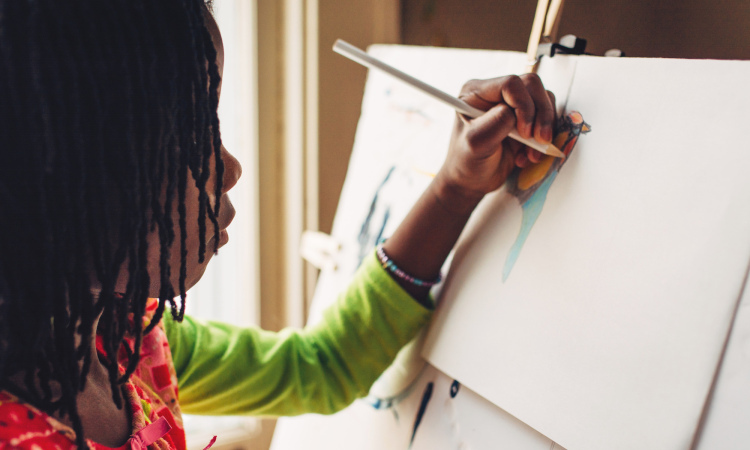 The kids mimic styles such as Surrealism, Impressionism, and Pop Art, using watercolors, stipple brushwork, mosaic, line drawing, melted wax, glitter, stickers, stamps, yarn and more. If that were as far as the lessons went, they would simply be a hands-on class in art history. But Esola doesn’t stop with imitating existing paradigms. The work leads up to the “Anything Apple” assignment, in which students are free to mix and match techniques in any way they like. In the final class, Esola draws an apple on the board again. This time, almost no one copies the teacher. Instead, the classroom wall is a gallery of alternative apples: students have taken what they have learned and launched in their own directions. An education in creativity lies in the sweet spot between unstructured play and imitating models. This sweet spot gives the students precedents to build on, but it doesn’t condition or constrain their choices. Students learn the best of what has come before with the goal of refashioning it. For instance, one fifth-grade teacher asked his class to paint the “next” painting by their favorite artist — a painting that had never been painted but should have or could have been. Each student studied an artist’s career and then imagined what they would have done if they had lived longer. One student painted a Little League baseball player in the Cubist style, arguing that if Picasso had survived, he would have taken a strong interest in popular culture. There are many ways to mine the past for new possibilities. You could ask students to tell a story from the perspective of a different character. For inspiration, take The True Story of the Three Little Pigs, in which author Jon Scieszka retells the story from the wolf’s point of view. The wolf claims he wasn’t trying to huff and puff and blow the pigs’ houses down — it was just allergies. Another creative way to display an understanding of history is to describe what would have happened if events had gone differently. What if the Mayans hadn’t contracted smallpox from the Spaniards? What if Washington had broken his leg and never crossed the Delaware? What if Archduke Ferdinand’s carriage hadn’t taken a wrong turn and he hadn’t been assassinated? To pull off counterfactual histories, students have to know the facts — and more than that, the larger context. They demonstrate a solid grounding in what is through their creation of what-ifs. 2. Explore many, many options. When we ask students for creative output, too often we are satisfied with a single solution. But with only one answer — no matter how good — an inventive mind is simply getting warmed up. The best practice in a classroom is to require students to generate not just one solution to a creative problem, but many. Generating multiple solutions takes training, and that training needs to start early. From literature to science to programming, students typically lock themselves prematurely into an answer; it takes encouragement and prodding to steer students away into wider explorations. Antoinette Portis’ picture book Not a Box illustrates the concept of proliferating options for young readers. Someone asks the rabbit protagonist, “Why are you sitting in a box?” The rabbit retorts it’s not a box: it’s a racecar. But the rabbit doesn’t stop there: it’s also a mountain, a robot, a tug-boat, a rocket, the crow’s nest of a pirate ship, the gondola of a hot-air balloon. Taking their cue from the rabbit, students can create their own version of this paradigm (“not a ball,” “not a ribbon,” etc.). This simple exercise works well with students of all ages. Two skills lie right at the heart of the future innovator: looking around and creating new solutions. Proliferating options also gives students an appreciation for the natural diversity they see in the world around them. Take the “sailing seeds” experiment, designed by the Botanical Society of America. Students study nature’s prolific means for seed dispersal: for example, burdock seeds stick to animal fur and then drop off; dandelion seeds float on “parachutes”; maple and ash seeds glide through the air on tiny wings. In the Botanical Society’s lesson plan, students compete to design new, better ways for tiny seeds to travel — and then they test the designs to see which ones spread most successfully. This exercise is a powerful way to grasp the concept of natural selection and its challenges. Instead of viewing the world around them as a preexisting set of facts to be memorized, students generate new options for what could be. This skill lies right at the heart of the future innovator: looking around and creating new solutions. In video gaming, “sandboxing” is the term for trying out options at a new level before competing — that is, a player can experiment with techniques and strategies before the game actually counts. A sandboxing approach can also be applied to creative assignments: students are asked to come up with multiple options for something creative, but these aren’t graded, just reviewed. The student then picks her favorite to develop to completion. This not only encourages students to proliferate options, it also gives an opportunity to take chances without penalty. Any problem with an open outcome promotes risk-taking; it’s up to the students to find their own way. Not every problem should be aimed at only one right answer, and this lesson can be illustrated by having students create a “super-font,” for example. In a standard typeface, some letters and numerals may look so alike that it’s hard to tell them apart, especially on smartphone and computer screens. For example, 5 and S are easily confused with one another, as are B and 8, or g and q. The goal of super-fonts is to alter the shapes of letters to maximize their visual differences. It’s a creative project without a fixed solution. Few capacities hold as much life-long value as an active imagination: it impacts every aspect of our experience. Another way to encourage risk-taking is to tackle real-world problems, ones for which the answer key has not yet been written. In NASA’s “Imagine Mars” project, students are asked to think up a manual for human life on other planets. This gets them to dissect all the features that enable a community to thrive on Earth: living quarters, food and water, oxygen, transportation, waste management, jobs, and so on. The students then have to consider what it would take to transplant those features to the Martian landscape. How do you breathe? What do you do with garbage? Where do you exercise? Using materials from cups to cotton balls to Lego pieces to pipe cleaners, the students design a community. Exercises like these can get students thinking at the cutting edge of science. To produce a thriving society of creative adults, it is crucial to inspire risk-taking students who don’t cower in fear of the wrong answer. Instead of having our children invest all their intellectual capital in the blue-chip stocks of life, a successful mental portfolio should diversify into more speculative investments as well. Few capacities hold as much life-long value as an active imagination: it impacts every aspect of our experience. Our homes, cities, cars and planes a few decades from now will look very different from the ones of today — there will be new medical treatments, new kinds of smartphones, new works of art. And that road to that future begins in the classrooms of today. Excerpted with permission from the new book The Runaway Species: How Human Creativity Remakes the World by Anthony Brandt and David Eagleman. Published by Catapult. Copyright © 2017 Anthony Brandt. Copyright © 2017 David Eagleman. Anthony Brandt is a composer and professor at Rice University’s Shepherd School of Music. He is also Artistic Director of the contemporary music ensemble Musiqa. David Eagleman is a neuroscientist and the New York Times bestselling author of “Incognito: The Secret Lives of the Brain” and “Sum: Tales from the Afterlives.” He is the writer and host of the Emmy-nominated PBS television series “The Brain.” This piece was adapted for TED-Ed from this Ideas article.